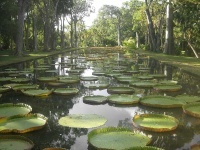 About seven miles (11km) northeast of Port Louis, and easily reached by regular buses, lies one of the island's premier tourist attractions, the Pamplemousses Gardens (now officially called the Sir Seewoosagur Ramgoolam Botanical Gardens, in honour of the late Prime Minister, but still colloquially referred to by their original name). The gardens are enclosed by beautiful wrought iron railings which are today in disrepair but when first manufactured in 1862 won a prize at an international exhibition at Crystal Palace in London. The gardens were first laid out in 1735 around a mansion house called Mon Plaisir as a vegetable garden to supply ships calling at Port Louis. Later the house was bought by horticulturalist Pierre Poivre, who introduced plant species from around the world interspersed with indigenous species. The garden is redolent with the perfume of fruit and spice trees, and the 24 hectares (60 acres) also sport a collection of stately palms, ebony, mahogony, latania and pandanus. A great attraction is a pond full of the Giant Amazon water lily. There are some animals in the gardens, including giant tortoises. There are usually guides available to give informative tours of the gardens for those who are interested, but it is also just a charming place to stroll or picnic, particularly on hot days when the shade and greenery is refreshing.